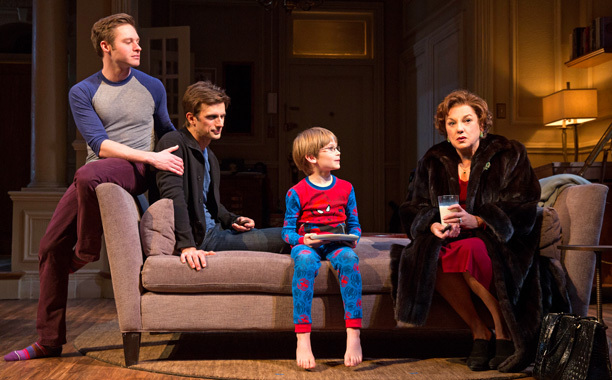 I saw Terrence McNally’s Mothers and Sons in previews on Broadway the other night. I liked it. It threw me back to a really sad time. This play is the story of a deceased actor’s mother showing up like 25 years later, after all this time, to reminisce about her son with his beloved. I think the two main characters, the mother and the lover, want forgiveness from each other. And basically I want that too. I want the characters to love each other, to get over their awkwardness. The mother, played by the amazing Tyne Daly, cannot give love and can hardly give acceptance. The two circle one another without coming to a resolution. Fortunately the new husband, played by Bobby Steggert, and the couple’s son arrive. Just in time, to cut through the BS and awkwardness. These two are the heroes because of their forthrightness – the new husband calls out the mother’s past injustices and the little boy articulates the family’s need for a grandmother. The play reminded me of how the AIDS crisis in NYC swamped us. I felt overwhelmed by this again, when my son was reading Angels in America for his Constructing America class and he asked me and Chris, “Did you lose friends to AIDS?” And we told him “Yes.” Among them, Chris’s actor friend Robert Farber, a great artist, a great friend, whom we visited in his West Village apartment when he was getting close to death. And I think that we are still bothered that we didn’t visit him more. So the play brought that up for me – how much of yourself do you give when you know someone is dying? I don’t think that’s true. There are people, like me and Chris, friends on the margins, who remember. We know what happened and we still talk about it. In the ’90s, I used to host my TV show, Mary Beth and Friends, at Manhattan Neighborhood Network right after Act Up taped their show. And I would schmooze with the on-camera people and the crew. I told them their stuff was cool, their interviews, their lying down protests, their silence=death. And I told them I supported them. But honestly, they weren’t all that interested in my opinion. They appreciated my support, I guess. But let’s face it, they had bigger issues. It was a crazy time. I worked at the Vista Hotel in the World Trade Center in the mid-late ’80s and lost a friend, fellow front desk clerk, He was a few years older than me and I was still in college. And he seemed to be one of the first deaths by AIDS. And it was so very hushed, very uncertain, a gay man’s disease, that we didn’t know how to talk about it. We didn’t have the words. The play reminded me about all that. About how we talk or don’t talk about death and dying. A year or so, I bumped into an actor friend whose partner/friend had died of AIDS. I told him I still often remembered his friend fondly. In the coffee shop, we didn’t get all maudlin. We just reminisced. We just talked about his friend, like it was 9/11. Like, such a tragedy. Still, it had not stopped our lives. Remembering a death can cause us to stop in our tracks, unprepared for grief, but the remembering doesn’t make us stop living. Now, about my home girl, Tyne Daly – she just throws lines out there, so naturalistically. I love her arch intelligence. She owns the stage. The other actors were wonderful too, but it was hard to know if their awkwardness was due to the great lady on stage with them or just the scenario of the play itself – the mother of a deceased ex descending for a night on your boisterous, wonderful, ongoing family life. What can you do? Keep living. Keep remembering. Keep talking. Silence=death. Disclaimer: Thanks to Mothers and Sons and Pivoting Media for the tickets. The opinions on this blog are always my own. Between a coincidence of my Netflix cue with some AIDS crisis-era movies and Dallas Buyers Club I’ve been thinking about those days a lot. Thank you for sharing about the time and about the play. I happened to hear a NY1 review of it this weekend and I’m glad to have your opinion to balance that out.